Birth date and place c. 1820, Ferns, Wexford, Ireland. 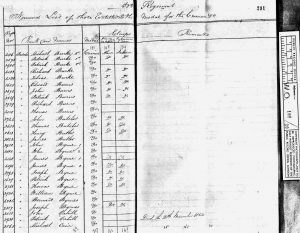 Baptism date and place 10 Oct 1820 Rathangan, Diocese of Ferns, Wexford, Ireland. England, Wales & Scotland 31 Singleton Road, Preston, Lancashire, England (1861). Children John 1856 Wigan, Lancashire. Death date and place 7 May 1885 Greenough, Western Australia. Will and Probate Letters of Administration: 29 Dec 1888. Probate: 15 Jan 1889 Supreme Court of Western Australia. 50th (The Queens Own) Regiment. Regiment No. and Rank #2768 Private. Attestation date and place 11 Dec 1840, Dublin, Dublin. Musters 1841 Quettah, Bombay, India [WO12-5352]. 1851 Ashton under Lyne [WO12-6143]. Casualty/Medical Gunshot fracture of right tibia received at Inkermann. Unfit for further service. 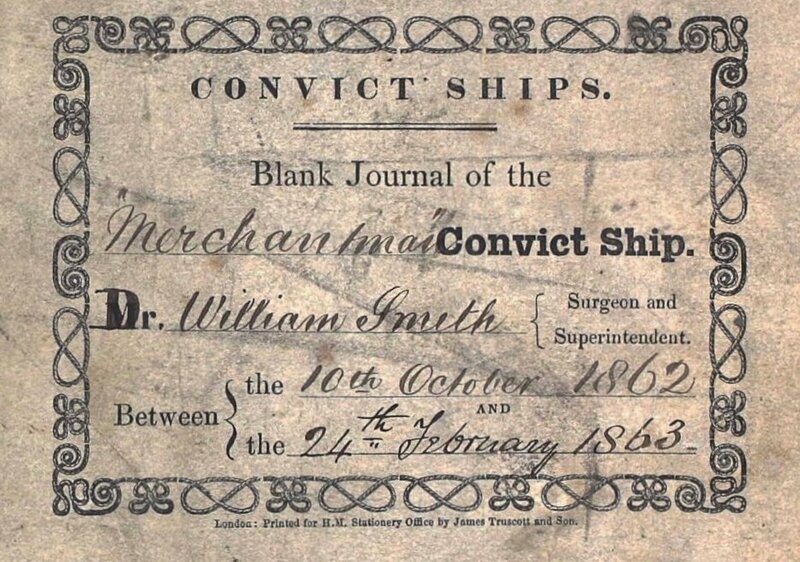 Sent home 24 Mar 1855. Regimental Courts Martial Tried at Calcutta 29 Dec 1847 for habitual drunkenness. Sentence 20 days imprisonment and loss of 1 d. per diem. Imprisoned 22 Dec 1847 to 17 Jan 1848. Discharge date and place 24 Jul 1855 Fermoy. Length of Service 14 years 201 days. Post Discharge Pension District Preston (1855). Bolton (1856). Bermuda (1862). Western Australia (1863). Pension Amount 1/- per diem. Increased to 1/3d. per diem 1874. Land Grant/Purchase 28 Mar 1889 Victoria Loc. 10X Bootenal (grant to son). 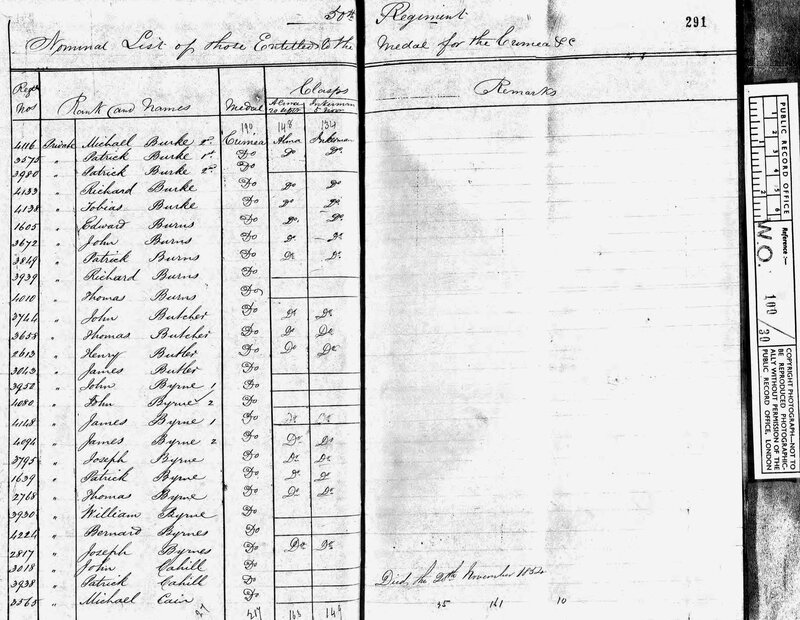 The Byrne family embarked on the Merchantman at Gravesend on 10th October 1862. 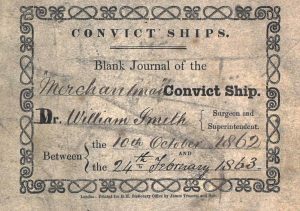 In the Journal of Dr. William Smith, Surgeon Superintendent, the conduct on board of Mrs Byrne and son John are described as very good [folio 43]. In the Punishment List of 23rd January 1863, Thomas Byrne is stopped two days of liquor after being reported by Sergeant Major Smith for being late for watch [folio 48].